Bistec a caballo is the kind of hearty, Colombian chow that will feed a child with a full grown appetite – and grow the appetite of an aged person. 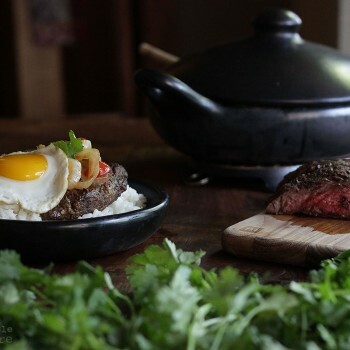 The seasoned steak and eggs are as easily gobbled up by children on the back porch (barefoot from playing in the creek, their minds already on the next adventure), as they are sliced up during a late summer dinner party (complete with twinkling candles, and bottles of Cerveza Ancla – a popular Colombian brew). 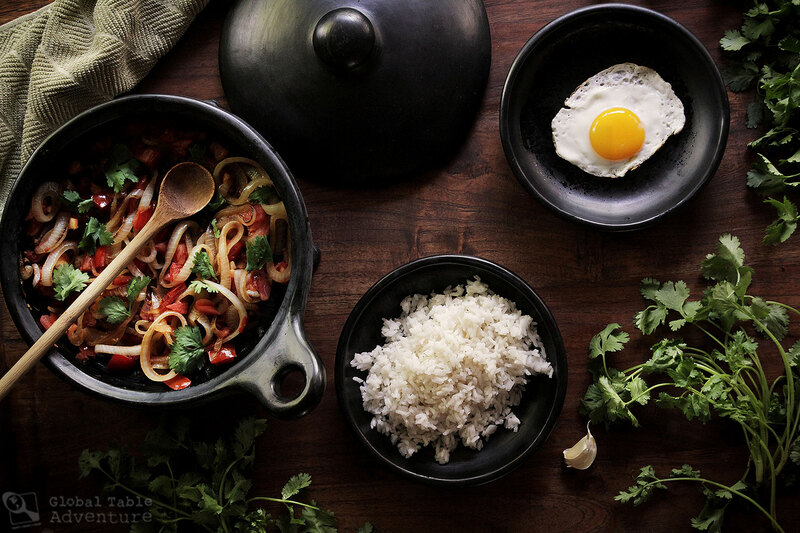 You’ll have an opportunity to host your own South American dinner party thanks to the authentic Colombian CEM Cookware featured in today’s photos. But first, let’s explore a delicious Colombian recipe to bring to your party. Though I had an overactive imagination as a child, I was never much good at certain types of pretend. I specifically remember trying to make myself have an imaginary friend because all the other kids had one. I drug a rope around as a leash for two pitiful minutes before I gave up. 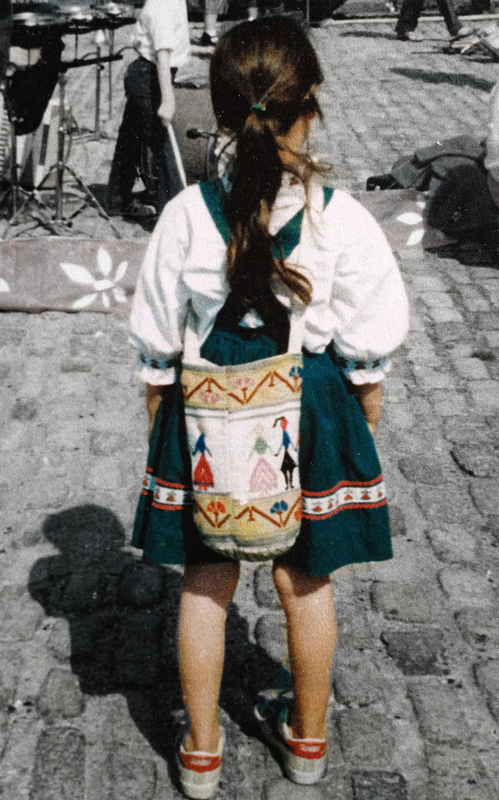 When I was about 6 years old. Even though I couldn’t conjure up characters, going on adventures in character was one of my favorite pastimes. My brother Michael and I ran the neighborhood as any number of characters. Often he was the Lone Ranger and I was Tonto – mostly because I loved Tonto’s brown and white horse named Scout. We didn’t have a creek to play in but our feet were chalky from running in the playground sand across the street. We were gone from the house for hours – finding rocks, sticks, and questionable scraps to play with – until we were so hungry we’d gobble up anything mom made. Little cowboy Michael loved when Mom made steak. As I prepared to make my first-ever batch of Colombian bistec a caballo, I couldn’t help but think about Michael’s love of steak. And I found myself wondering about the Colombian experience of childhood. I stumbled across a snippet of poetry from the Colombian modernist poet José Asunción Silva (1865-1896) – the man immortalized on the 5,000 pesos bill. And call upon those memories! I can relate to Silva’s impassioned sentiments. Michael has been gone since 1992 – just a boy himself when he died – but my hallowed memories of long afternoons romping through the neighborhood on an imaginary horse are certainly sweet… even if they are part fantasy. 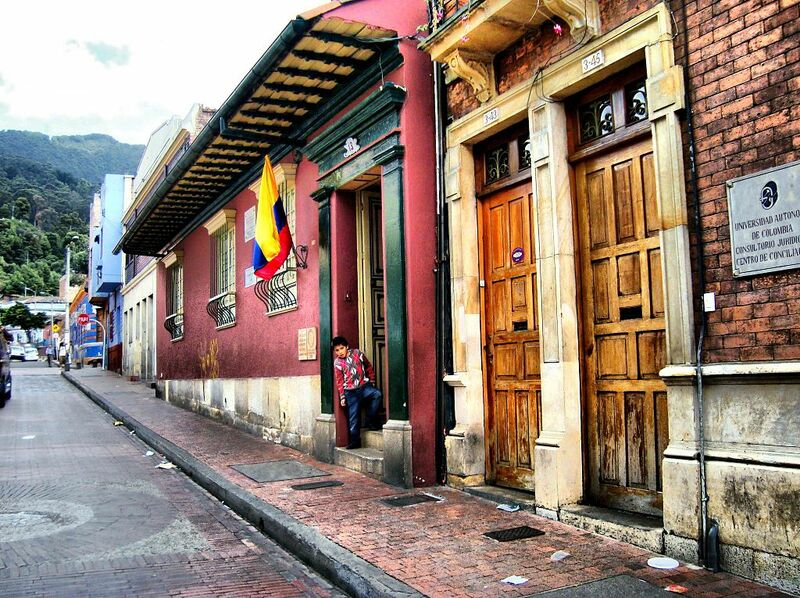 A child plays in the doorway of Silva’s house in Bogotá . Photo by Martinduquea. 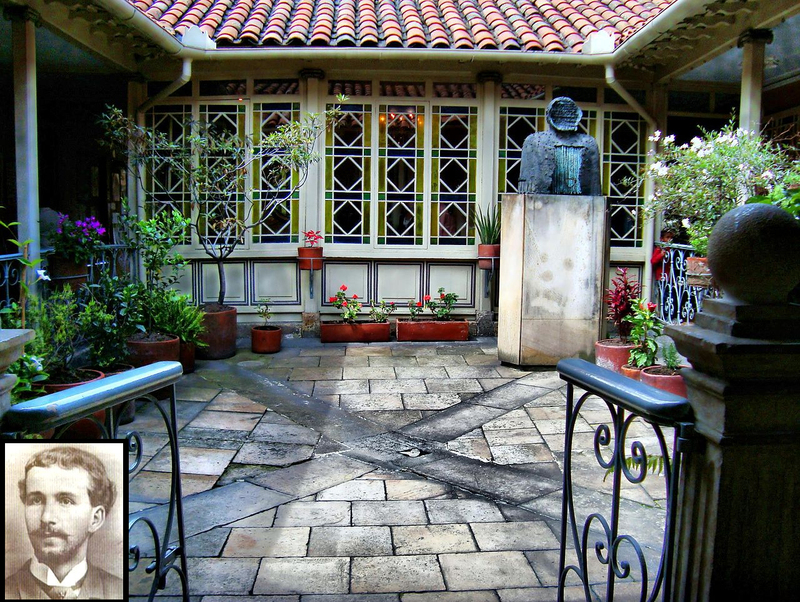 Silva and a photograph of his courtyard today (courtyard photographed by Martinduquea). What does bistec a caballo mean? I’d like to think bistec a caballo is the kind of meal Michael would have gobbled up. 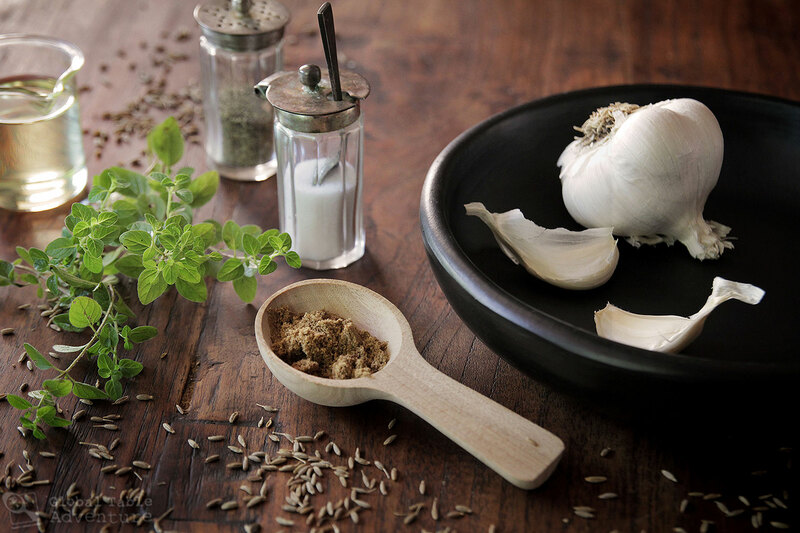 Sure, the seasonings are different from what Mom would have used – cumin, garlic, oregano, and cilantro – but the spirit of the thing is right up his alley. But alarm bells might go off if you know Spanish. After all, caballo means horse. But have no fear. Tonto’s beloved Scout was not harmed in the making of this dish. Bistec means beefsteak – and, in poetic terms, bistec a caballo is a Colombian cowboy feast… a dish on horseback, so to speak. 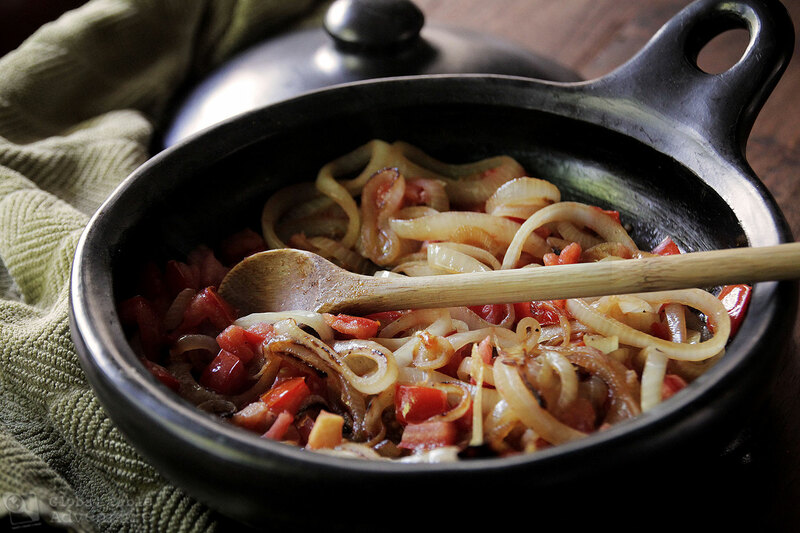 To make it, most Colombians add flaps of steak to a pan along with onion, tomato, and the occasional crush of garlic. 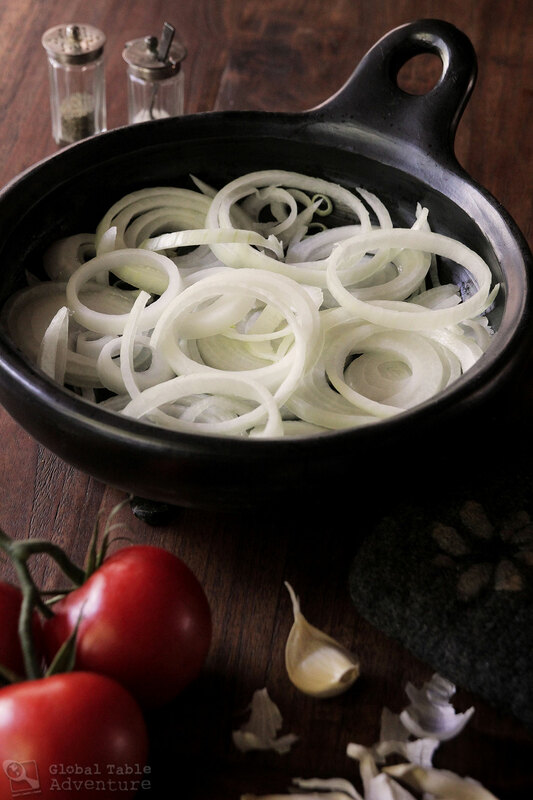 But I was drawn to the recipes that marinate and grill the steak – this gives it an unctuous crust and deeper flavor – before topping it with pan-fried onion and tomato. So, who is the rider? It could be the smothering of onion and tomato. Or it could be the fried egg. I happen to think it’s all three. First, marinate a tender cut of steak in oregano, garlic, cumin, oil, salt, and pepper. Let the steak rest this way for a good hour. Overnight is fine, too. 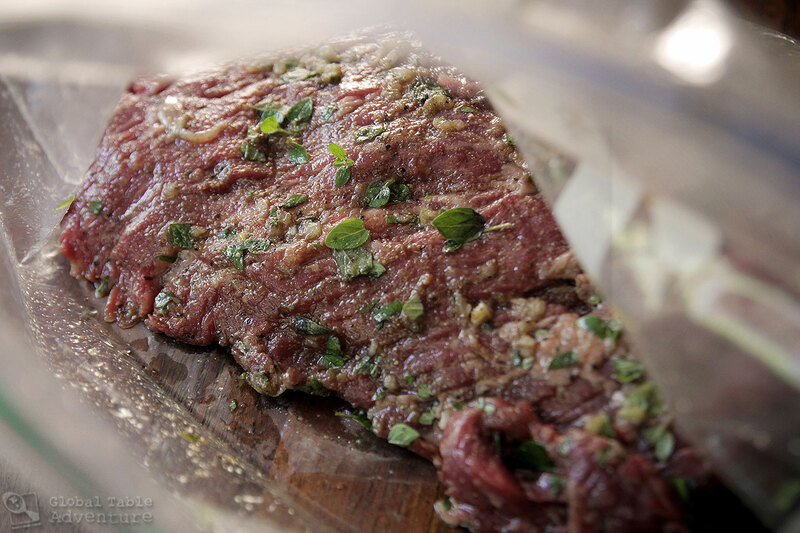 My family loved flap steak for this recipe; it’s well-marbled with loads of nooks and crannies (these crevices help the marinade soak into the steak). You could also use skirt steak but it’s a bit less porous and more expensive. When you’re almost ready to eat, cook up some rice. Meanwhile, add a pile of onion to a well-oiled pan. 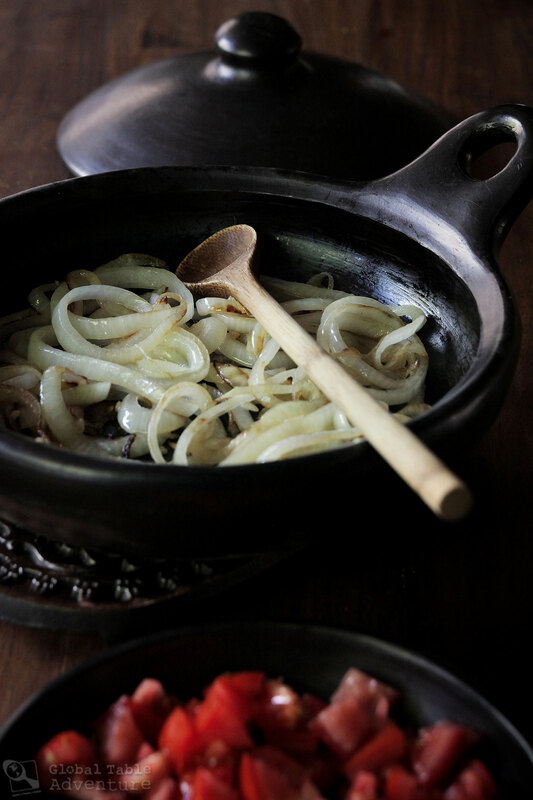 This Colombian clay skillet keeps the onions moist, even as the turn golden. Once they soften, add some garlic and chopped tomato. Season well and cook until the tomatoes have just begun to slump into the onion’s sweet warmth. Next: grill the steak and fry some eggs. I like to grill my steak over high heat for several minutes per side. Cooking times will vary depending on the thickness of your cut – but mine was medium after 5-7 minutes per side. 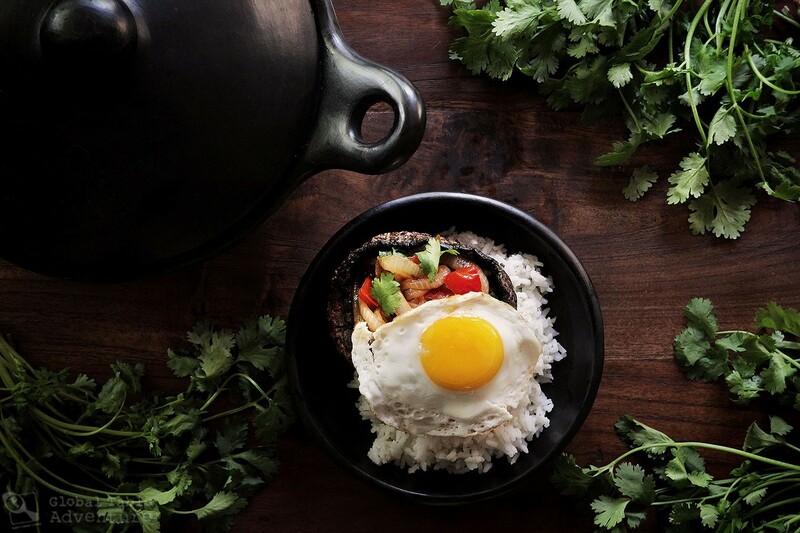 Each person gets rice topped with steak, the onion mixture and a fried egg (don’t forget to add a sprinkling of fresh cilantro). Enjoy for brunch, lunch, or dinner. Oh, and vegetarians (like my daughter) can substitute a portabella mushroom for the steak … just marinate it the same way! One of you will win Colombian cookware and plates for your very own dinner party, generously provided by Colombia es Mas Cookware (CEM Cookware). To enter, simply leave a comment sharing what you’d like to cook in the casserole! A winner will be selected by 8/24/2015 and announced in this post. Cumin, garlic, and oregano seasoned steak served over rice - and under onion, tomato, and egg. Wonderful for a dinner party. Cut the steak in 2-4 pieces. Add to a plastic bag and toss well with marinade ingredients. Refrigerate for about an hour or overnight. When you're almost ready to eat, cook the rice. Meanwhile, fry a pile of onion rings in a well-oiled pan over medium heat. When they soften and begin to brown add the garlic and chopped tomato. Season well and cook until the tomatoes have just begun to slump into the onion. This should take about 5 minutes. Garnish with cilantro. Grill the steak over high heat (depending on thickness and size of cut, this could be about 5 minutes per side). Fry the eggs while the meat rests. 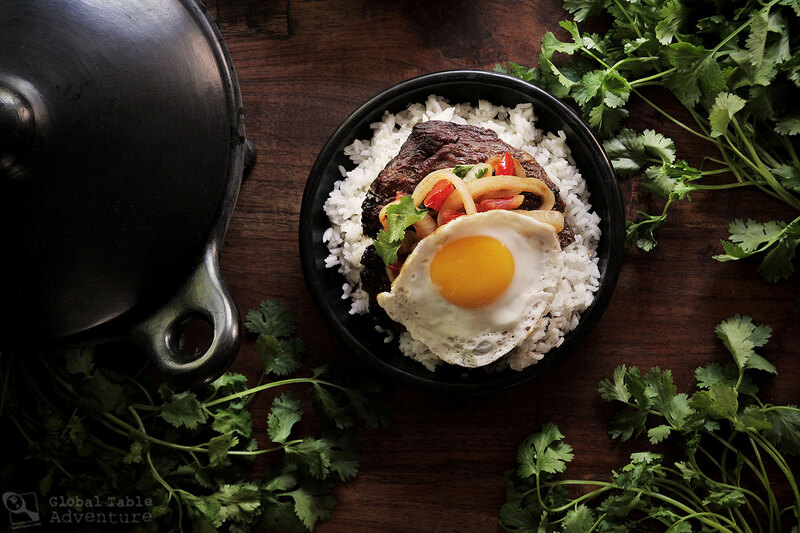 Assemble the dish: Each person gets rice, topped with the steak, then the onion mix, a fried egg, and a sprinkling of fresh cilantro.Enjoy for brunch, lunch, or dinner. What a lovely set. I’d make a chickpea casserole. I’d love to make some kind of soup since Colombians seem to be big time into them, maybe I could learn to be a fan. Which one would be up to what I can find at my local local market. The cookware sort of reminds me of something I saw at a Korean restaurant that bibimbap was made in, or it could just be the similar ingredients, fried egg, rice (crusty in the bottom of the pan in bibimbap, if I am remembering correctly) and beef. I would love to try to make bibimbap in this! Just finished your book, loved it! Making your bolognese sauce as soon as summer ends and I am motivated to be near a stove! That is beautiful! I think I’d like to cook up some ratatouille in this set! Since its summer and zucchini season, I want to bake my mom’s zucchini casserole. How wonderful! These would be perfect for my summer squash soup! Thank you for the wonderful giveaway. How delicious, I want to make the bistec a caballo now! I would also like to try making some traditional Columbian hot chocolate…yum!! Cookware like this makes me want to venture into areas of cooking that I haven’t yet explored! The first thing I would do is seafood paella. How fabulous to win these!! A friend and I are planning our 61st International Dinner! I don’t believe we’ve done Colombia…yet! Thank you for all your inspiration, Sasha! I’d like to cook some Mayacoba/Peruanos beans in the pot. I am in love with their subtle flavor; kind of like a cross between white beans and ? Haven’t quite figured that other one out yet. Their yellowish color is also appealing. Thanks for the opportunity to win the set! Hello Sasha! Delicious Recipe, ( I’m a foodie by heart chef by trade) I can picture my self cooking Chicken and Dumplings, Beef Tagine, Grandmother Luigi’s Bolognese sauce, BBQ pulled pork in this Awesome Cookware P.S Love Your Site! We have just discovered quinoa, so I see me trying a recipe with that in this cookware. I would make a delicious green chile cheese square casserole and the next week, green chile stew! PS. My son-in-law was born in Venezuela and his grandparents are from Colombia! We put a version of this recipe in their recipe book that they gave out as gift to all who attended their wedding. It has his and our family recipes! Beautiful post! I’d love to make a Moroccan beef recipe I have, in that cookware. I just returned from a trip to Colombia. We had the most amazing chicken and potato soup, Ajiaco Bogotano, prepared and served in this same sort of cookware. I got the recipe from a local woman and I would cook this. I would make an Eastern European dish, with cabbage, onions, tomatos, garlic, and peppers straight from the garden, layered with a rice and ground beef mixture and topped with a tomato sauce. Beans! I would love to test the theory that beans are better when cooked in a clay pot. Many thanks to you and CEM Cookware for offering such a wonderful giveaway. I imagine a big beautiful stew in this gorgeous cookware. Ohhhh….how I would love to have this in the middle of my table. What beautiful cookware!! Pick me, pick me!! I would like to cook some black beans with cumin, onions, cilantro, tomatoes, fresh ground peppercorns, and onions. Fingers and toes crossed!! Wow, gorgeous! My homemade salsa would finally have a perfect home… And in the casserole I would make our favourite summer vegetable soup from Linda McCartney … Thank you for this opportunity! I would like too cook my beans in those beautiful pots. The cookware reminds me of home Enttebbe When we go to the village, we cook with clay pots – oh the flavors that come out of a slow roasted groundnut stew. I am curious if this flavor might best be mimicked in this casserole pan. Perfect for curries. Coconut curry and jamaican chicken curry. Besides the said curries (because I, too, would make a coconut curry any day of the week…and often do…), I would simmer some meat and veggies in there until the meat fell off the bone and I had a hearty, healthy bone broth stew. As a young professional on a budget, this cookware would be a beautiful piece in my humble kitchen! Baked apples. But then, I always think of dessert first. I would absolutely cook a bean soup of some kind, looks perfect for a really spicy hot Chili. 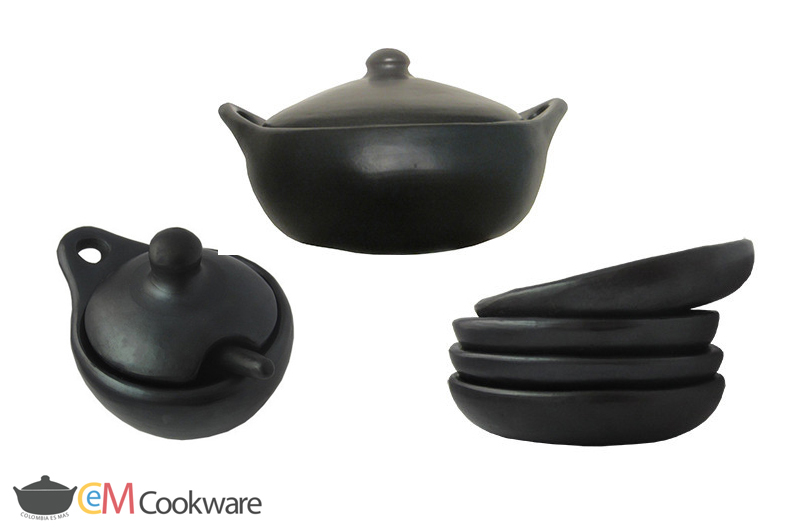 Gorgeous cookware! Looks perfect for a big batch of chili on a cool fall evening. I do a lot of baking, so the possibilities are endless! But a colorful ratatouille would really contrast with this striking set. Just old fashioned baked beans! I was browsing the library’s new book section when I found your book and promptly went home and devoured it. Thank you for sharing your life with us. You made the painful parts of your life beautiful in the telling and gave me hope that I too could take the bad parts of mine and make them into something better and helpful to others. So many times we keep that pain hidden, that door closed. Life hurts, and here we are on this beautiful day going forward and finding love and friendship and hope. Love your story, Ashana – from your words I feel you are on your path. 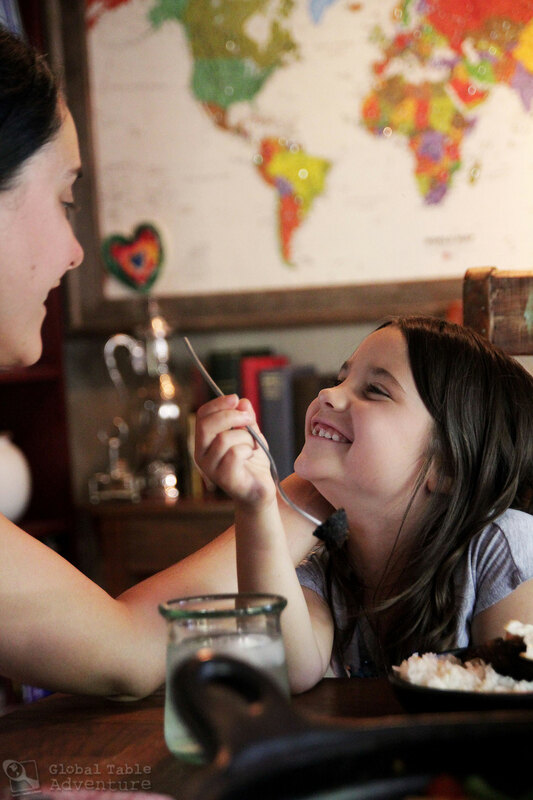 And I love what you’re doing for/with your daughter. Please give her a hug for me. These look amazing! I would love to cook fried rice in these, have the rice precooked and add a raw egg that cooks with the steam from the rice. DELISH! I am going to make this dish only with the venison steaks a friend recently delivered. I don’t know the Spanish word–it might be venado a caballo. In this big casserole, I might place a yummy spicy Caribbean-style chicken dish with homemade salsa. I would love to cook what you just made! Makes my mouth water! Thank you for this fabulous giveaway! In the big casserole with the lid I would slow cook shell beans, shredded cabbage, and garden tomatoes with spicy sausage and plenty of garlic! I would serve this with potatoes and yams roasted by the serving in the smaller platters. I would use the small side dish to serve a sauce of some type – maybe a cilantro based spicy sauce. Yum Yum Yum. I would take these heirloom beans I bought and make Cuban Black Beans which come out so delicious with the onion and pepper and garlic, some cumin and vinegar. They are so delicious and anything cooked in clay, especially beans, are supposed to taste even better! I love these black dishes. I would love to braise some chicken with figs and serve on warmed plates. Slow Braised Pork Shoulder with Chimchurri and Arepas! Love braising in La Chamba pots! I bought my first on YEARS ago, the large bean pot. I would make a version of beef carnitas. With some fresh herbs to top and tortillas. 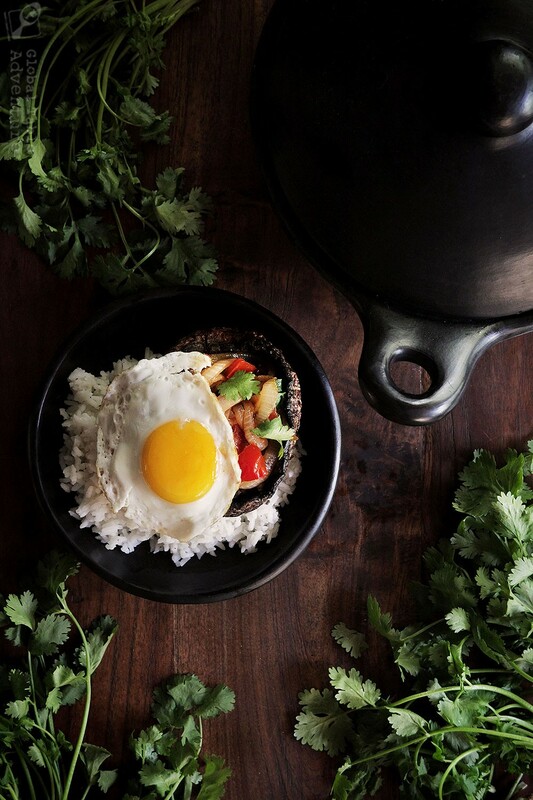 I’d try a Korean bibimbap recipe sizzling to the table. Yum! I like to mix cultures, so I’d cook a cassoulet that is a family favorite! 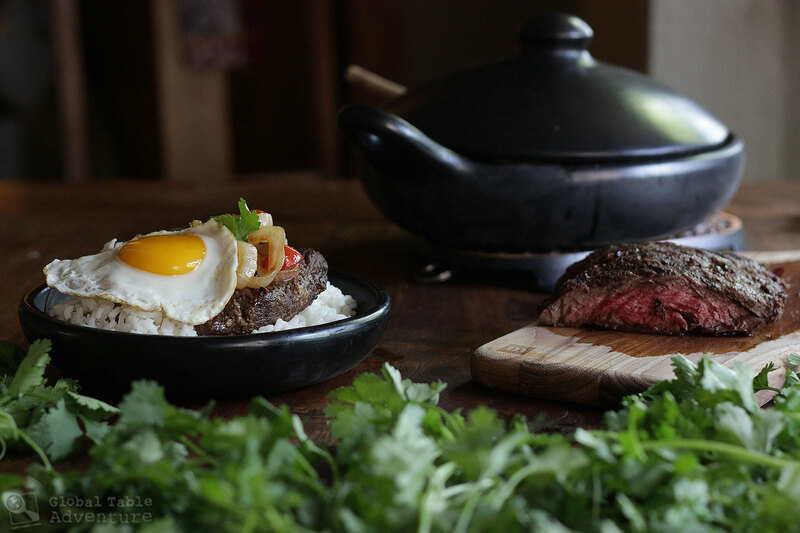 I would love to try the Colombian Steak & Eggs | Bistec a caballo recipe from your post. What a great give away. Being a veteran..I had the chance to eat food from all over the world…for me – chorizo, chicken, onions, chick peas, tomato…eggs and some bread. I would make Mole with avocado pico! I love the cookware! I’d probably use it to make stews, and a good paella. We made Bistec a caballo the day after you published it – it’s wonderful! And I’d happily make it again to serve in the beautiful cookware. I love the way the black ceramic essentially frames and enhances the color and presentation of the food. 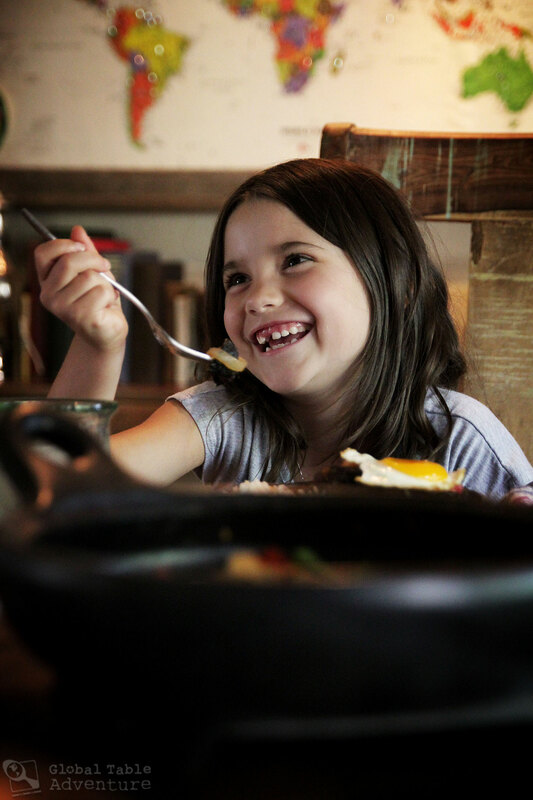 I’d also use it to serve another of our favorites – Bibimbap, though now that I’ve given it some thought, I can’t think of a dish that wouldn’t look great in that cookware. I’d make a baked mac and cheese or ratatouille. My friends and I have started a dinner club with our husbands and this month’s food is from Morocco. I would choose a chicken dish with preserved lemon, green olives and thyme.